For the past several years, I have given presentations to classes of future leaders here in the Hudson Valley at the invitation of the Ulster Leadership Development Institute. This twenty-five-year-old program is sponsored by the Ulster County Regional Chamber of Commerce and the Chamber Foundation. It is coordinated by the foundation’s Executive Director, Ingrid Kulick. Through the nine months of the program, students learn leadership skills from a host of local leaders as well as key information about businesses, nonprofits, and government. I have always enjoyed telling my story to this group, which is made up of 20 individuals eager to participate in the community as volunteers and leaders. The sessions are usually held in a conference room and the speakers often use PowerPoint presentations. 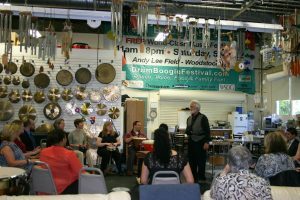 Since my presentation includes a hands-on drum circle and demonstration of many instruments, the group comes to my studio at the home of Woodstock Chimes. The last session of the class of 2017 started with a drum circle and ended with a performance of mechanical musical instruments in my collection. A drum circle is quite effective for this type of gathering since it demonstrates the need to listen to one another, to be part of a creative community and to, in some cases, come out of one’s shell. It also helps keep people from falling asleep, which they might do if all I did was to talk! Inevitably, the results are wonderful. Everyone is surprised about the sounds they make and happy about the creative musical process that most have never experienced. The part of the session in which the collection of mechanical instruments were heard included a type of player piano called a Reproducing Piano, which is capable of playing dynamics from very soft to very loud. We heard music recorded onto rolls by Rachmaninov, Nancarrow and Gershwin. The demo started with a large Regina music box from the late 19<sup>th</sup>century. A cylinder phonograph invented by Edison, also from the late 19<sup>th</sup> century, was heard. These individuals were leaders and innovators and have served as an enduring inspiration to others. Mechanical instruments that are run by paper rolls with holes punched in them were precursors of the modern computer since the information is binary: the valves that activate a note are either open or closed. Edison’s record players eventually led to the reproduction of sound we now download from the clouds. The leader of a drum circle is called a facilitator. Good leaders gain consensus though facilitation rather than mandate. Everyone is capable of creativity and leadership. Working with people such as these who are passionate about making a difference gives me hope that the next generation of leaders will facilitate a future inspired by much-needed humanitarian ideals.